Heat oil in a large saucepan over medium heat. Add minced onion and garlic; cook 5 minutes until softened. Add chickpeas, broth (or water) and salt and pepper to taste. Cook 10 to 15 minutes until chickpeas are softened. Using an immersion blender or a regular blender, blend mixture (in batches, if necessary) until smooth. Bring to a boil. Slowly whisk in polenta. Decrease heat to medium. Stir polenta constantly 15 to 20 minutes until very thick, like pudding. Once cooked, pour into a lightly greased rimmed baking sheet; spread evenly with a spatula. Cover with foil and refrigerate 2 to 3 hours until chilled and set. Meanwhile, heat oven to 400°F. Toss cut squash with olive oil, salt and pepper. Roast until soft, about 30 minutes, stirring occasionally. Using a cookie cutter, cut polenta into 2 to 3-inch discs (or slice into squares). Place discs on a lightly greased baking sheet. Brush tops lightly with olive oil. Bake until golden brown on the top and slightly crispy, about 30 to 40 minutes. 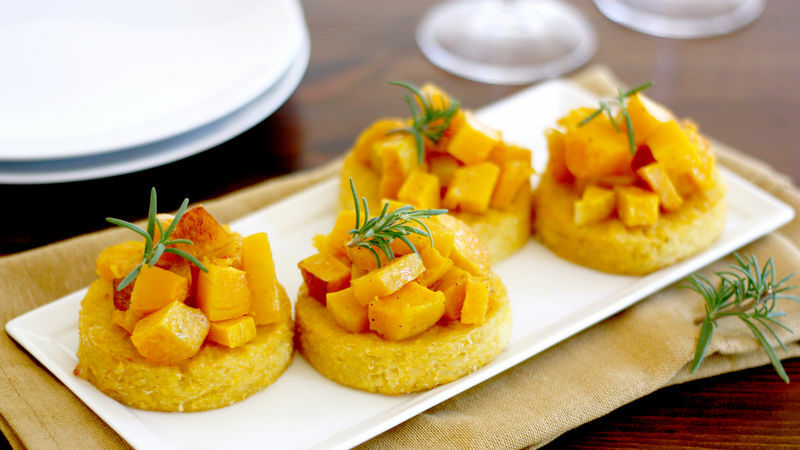 Top polenta discs with squash and a sprig of rosemary. Step aside, slow cooker meatballs. There’s a new appetizer in da house, and its name is Mini Butternut Squash Polenta Bites. These cute ‘n’ tasty little appetizers are sure to revamp your boring munchies table at your next fall party. A crispy, toasty chickpea polenta cake serves as the vehicle by which roasted butternut squash and fresh rosemary get into your gullet, and the whole thing tastes like something you wish you knew about a long time ago, so you could eat more of it. They take a little time and they take a little love to make, but you won’t regret a minute of it – and your guests will be oh-so-glad you didn’t, either. No regrets! Let’s make some snappy appies! Part of the base of this appetizer is made with chickpeas, for added flavor and texture. Just a little less than two cans of Progresso chickpeas will do the trick for this recipe. In a large saucepan, cook minced onion and garlic in oil until softened, then add the chickpeas, some water or Progresso chicken broth and salt and pepper to taste. Cook until the chickpeas are soft. Blend everything until it’s nice and smooth, then bring the mixture to a boil. Slowly whisk in some polenta, then reduce the heat. Cook the polenta mixture, stirring often, until supah thick, like corn pudding. Spread the stuff in an even layer onto a rimmed, lightly greased baking sheet. Cover and chill in the fridge a few hours until set. Meanwhile, roast some butternut squash until it’s nice and soft and roasty toasty. Cut the chilled polenta into small discs, then place the discs on a clean, lightly greased baking sheet. Brush the top of each disc with a wee bit o’ olive oil. Bake the discs until golden brown and toasted on top, then top them with the roasted butternut squash. Top the bites with sprigs of fresh rosemary, and serve. Sorry, veggies and dip – you ain’t got nothing on these cute ‘n’ tasty little bites! If you need Stephanie (aka Girl Versus Dough, she’ll be at the appetizer table chowing down on about a bazillion of these bites. Check out Stephanie’s Tablespoon member profile and keep checking back for her own personal recipes on Tablespoon!